Bucking conventional marketing industry thinking, Duluth, Minn., routinely draws exceptional marketing talent from what are considered America’s top marketing hubs. 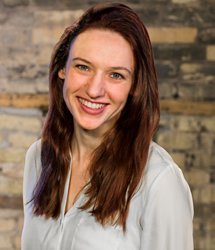 Marielle Breneman is the latest talented digital marketer to relocate to Duluth to expand her career with Aimclear® - a Minnesota-based digital marketing agency that serves clients ranging from local organizations to Silicon Valley startups to iconic global brands. Breneman recently joined Aimclear following a rapid rise in the digital marketing hotbed of Portland, Oregon. Relocating to Duluth to become Associate Accounts Manager with Aimclear, Breneman brings a strong background and proven skills in digital marketing, paid social, search engine optimization (SEO), pay-per-click (PPC), content development and web design. Her presence at Aimclear extends the company’s deep bench of digital marketing pioneers. As Associate Accounts Manager, Breneman will work directly with Aimclear’s internal teams to develop and execute digital marketing campaigns for multiple clients. Aimclear supports a broad spectrum of organizations, from local companies to aggressive startups to iconic global brands. Among Breneman’s first public engagements with Aimclear, she returns to Portland this week to help lead an in-depth digital marketing workshop alongside Weintraub and Aimclear Account Management Director Megan Taggart. The three will conduct a full-day session on social psychographics, integrated search and radical audience targeting. The session takes place today in conjunction with the Search Engine Marketing Association’s annual Engage Conference in Portland, Oregon. Aimclear® is a 6x Inc. 500/5000 digital marketing agency dominant in audience targeting and customer acquisition. The company's differentiator is the Tao of holistic brand-builds and integrated psychographic performance marketing attribution. As Aimclear also distributes segmented messages to influencers for buzz, links and earned-media, the agency has evolved to be the missing link unifying search, social, PR, influencers and psychographic display. More information is available at aimclear.com.